The Challenge: Creating content that is conducive to social sharing can be tricky. Here’s how Disney used smart and creative magic to crack the code. Disney is using a mock university website and a promotional video spoof to promote the new Pixar movie “Monsters University.” At first glance, both look like the real deal. The Monsters University (MU) website, for example, gives visitors a chance to apply for admission, learn about life on the make-believe campus or even purchase college gear like hoodies and travel mugs. The YouTube video, “Imagine You at MU,” looks a lot like your typical college promotional video, as well–until you realize that most of the students have neon-colored fur! So, what’s the value to marketers? When done properly, shareable content can take off and build remarkable momentum. Case in point: Since Disney released the MU video on Jan. 1, it has received more than 610,000 hits. Additionally, many of the people who viewed the promotional video will likely be among those who head to theaters when Monsters University opens on June 21. In a column written for Marketing Land, Courtney Seiter shares nine rules for creating quality shareable content. Among Seiter’s tips: Focus on content that is useful, funny, encourages sharing, and strikes a positive chord with your audience. Make Sharing Easy. Create neatly-packaged content. Videos and images work well, but they certainly aren’t the only options. Infographics, for example, can be especially successful in the B2B sphere. In fact, Stew Langille, former VP of marketing at Mint, says blog posts that incorporate infographics on Mint’s corporate blog generate 30 to 40 times more page views than text-based content. Ignite the fire. Include links in as many different forms of communication as possible (digital newsletters, email signatures, etc.). Additionally, Allyson Locke, an internet marketer for Union Street Media, says it’s important to make sharing easy by adding follow and share buttons. “If people have to hunt for a Facebook or Twitter share button, chances are your content will never be shared,” Locke said. Encourage engagement. 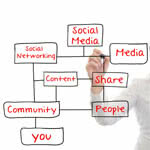 Contests, giveaways and other interactive content can be a great way to encourage social sharing. If done well, your fans and followers will want to spread the word and encourage their personal network of followers to participate, as well–and that’s social sharing at its best. Looking for more content on marketing? Head over to our marketing resource center page, where we’ve compiled the top marketing software product reviews and useful blog content.